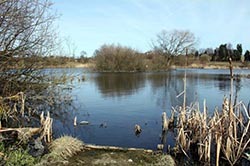 Hartlepool DAC control the fishing on this four and a half acre members only, former quarry. There are two islands, the average depth is 9ft. The venue has recently benefited from a healthy restocking programme. It's a mixed fishery with a good head of bream to 8lb, carp to 20lb, tench to 7lb, chub to 2lb plus roach, rudd and perch up to the 1lb mark. No day tickets. Hartlepool DAC season £70 adult inclusive of a one off £30 joining fee, concessions are available. Members can apply for a night permit. Fishing dawn until one hour after dusk. Disabled access. All permits from Anglers Services, 27 Park Road, Hartlepool, TS24 7PW. From the north end of Hartlepool pick up the A179. Go over the A19 onto the B1280 towards Station Town and Wingate. At the far end of Station Town, turn right. Go down here and the fishery is through the locked gate, on the left.